Ooma Office is a user-friendly basic VoIP system for very small businesses. It’s easy to set up and has a highly intuitive graphical user interface for managing the system. Any additional extensions or conference calling costs extra money; extra expenses can add up quickly. One Ooma Office device only supports up to five physical extensions (although up to 20 virtual extensions are the max). 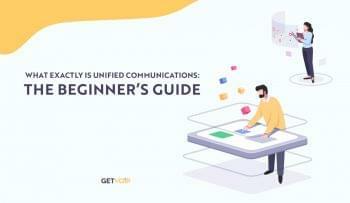 The only integration with mobile phones (besides call forwarding) is an Ooma mobile app, which needs a lot of fine-tuning, to state the least. No support for HD voice. Lacks features in comparable services including integration with Microsoft Office and call queueing. For an initial startup cost of $200; a monthly subscription of $19.98 per month; an extra $9.99 per month for any extension you want to add; plus another $9.99 per month for any conferencing capability, Ooma may not be an affordable option for the average small business. If users want the professional image of a receptionist, multiple extensions, hold music and other business telephone features, Ooma Office is lacking in those areas. A variety of customer support options. Gives a small business a professional telephone presence to customers. Adding extensions and features can get pricey. Lack of good mobile integration (as tested on Android). No support for HD voice. Requires purchasing additional stack device to increase number of extensions. Some performance latency in the management interface. Ooma Office is VoIP for small business. It uses broadband Internet for calls and has a few professional telephony features of enterprise-level VoIP such as call groups, call forwarding, conferencing and more. Adding additional features and extensions can make the monthly price of Ooma Office add up quickly and it still lacks some features of competitors like RingCentral Professional including robust mobile support.. However, it’s very easy to setup and use and does add telephone flair to a small business’s image. 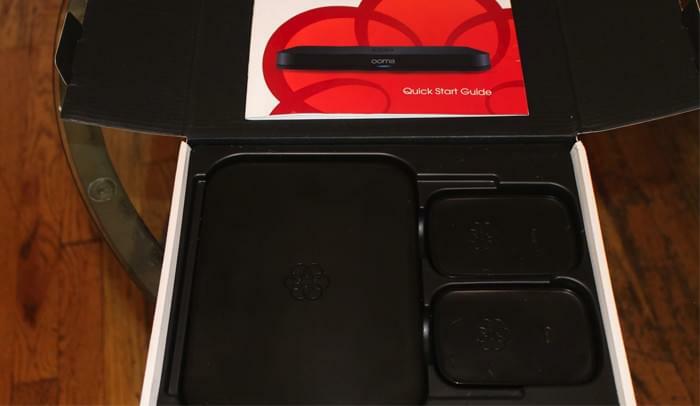 Ooma Office ships neatly packaged with a setup guide, two Linx devices (for adding additional phones and fax machines), the Ooma base station and an Ethernet cable. The base station connects to Internet broadband and routes calls to phones.. The base station looks very much like a router; its dimensions are 1 by 7 by 5.6 inches (HWD), so it’s quite small and shouldn’t take up a lot of room next to a cable modem or router. 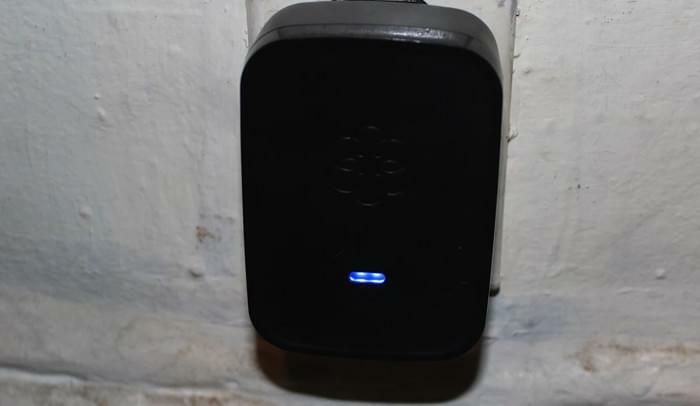 This small, glossy black box, has a WAN and LAN port on the rear panel, an RJ-11 jack for plugging in a standard phone, a USB port (you can connect accessories such as USB handsets) , power and a push-button labeled “Page.” This button is for syncing with the Ooma Linx devices. There are two Linx devices shipped with Ooma Office. They are plugged into a power outlet and are used to wirelessly connect additional phones or fax machines to Ooma. 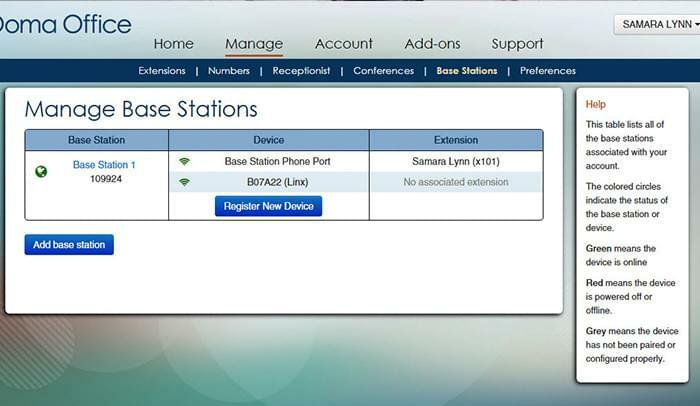 Linx connects to Ooma via its the DECT 6.0 wireless radio. The range of the radio is about 150 feet according to Ooma’s specs. Ooma Office also ships with a 7-foot Ethernet cable and AC adapter. You can also request porting your current business phone number(s) to the Ooma phone service. You have to enter a credit card to start the monthly subscription: $19.98 per month (not including taxes and fees). Adding additional users and phones are another $9.99 per month for each addition. However, before any configurations are made in the interface, it’s necessary to install the Ooma base station. It would be ideal if the interface notified users to do so at this point during setup and also offered visual guidance. 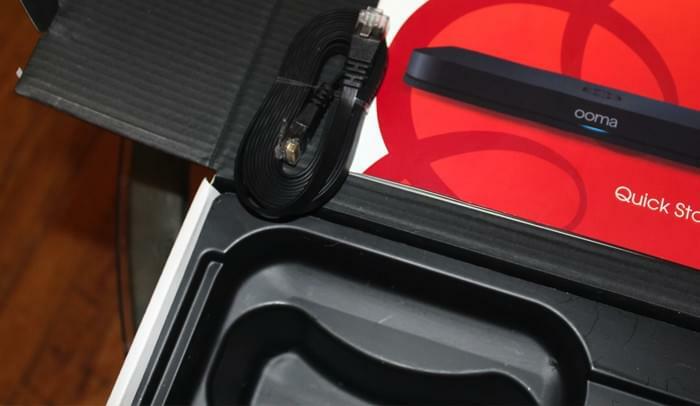 You can use the quick setup guide for instructions on installing the base station.The preferred method according to Ooma’s instructions for connecting the base station to your Internet is to connect the base station between your router and cable modem. This means removing the Ethernet cable connecting a cable modem to a router, from the router’s WAN port and connecting it to the base station’s Internet port. You then connect the included Ethernet cable to the LAN port of the router and the LAN port of Ooma. Ooma states this is to allow voice calls to be intelligently prioritized over other types of data traffic on your network. A potential problem with this setup method is that it can cause you headaches when trying to troubleshoot issues with your Internet connection or router. Any extra device between a router and cable or DSL modem adds a layer of complexity to troubleshooting Internet issues. 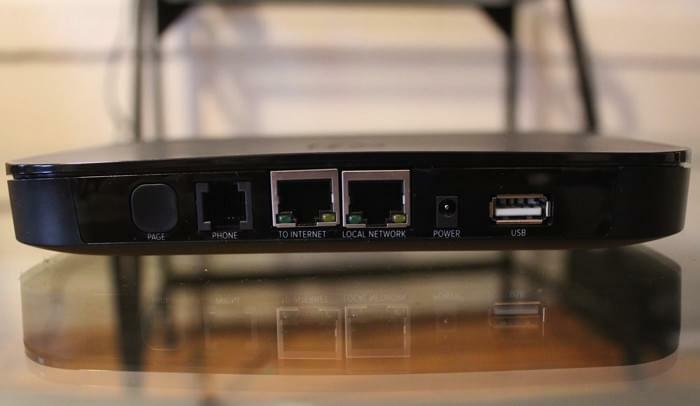 I prefer the alternative setup of the base station: You can add Ooma behind your router by connecting it to one of your router’s LAN ports. This is how I set it up to test and it worked. Be advised, if you go with the alternative method and experience any problems with Ooma, its customer support will probably annoyingly tell you to place it between the router and modem to see if that fixes any problems. When the base station is connected, power up the Ooma Office and wait for it’s LED to turn solid blue. This means that the base station is fully operational and online. 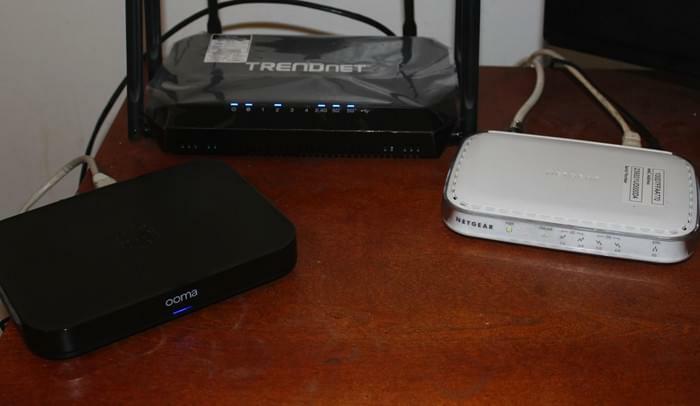 In the image below, I have Ooma Office connected to the LAN port of a Trendnet AC3200 router which in turn, is connected to a Netgear CMD31T cable modem. To set up the Ooma Linx devices for connecting additional phones or fax machines to the base station (each Linx has an RJ-11 telephone jack underneath for connecting a phone or fax), connect the Linx into a power outlet. It has an LED which turns amber and then blinks while it waits for a base station with which to connect. Next step is to press the “Page” button on the base station for three seconds to place it in activate registration mode, to pair the base station and Linx. When the two are paired the Linx’s LED turns blue. 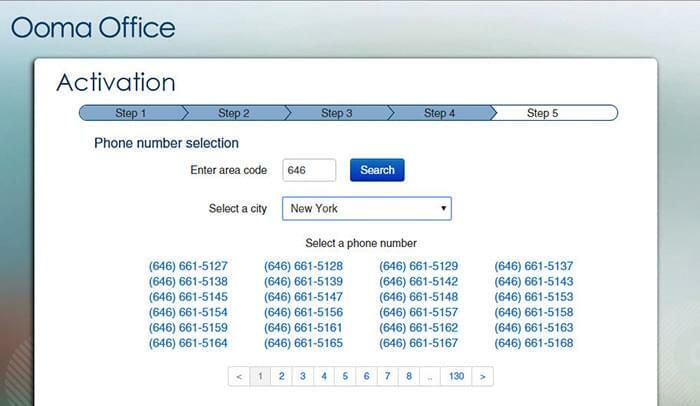 One of the first things you may want to do is edit the Virtual Receptionist settings. This is also very easy to do; just click on Manage and then the gear icon next to Virtual Receptionist. 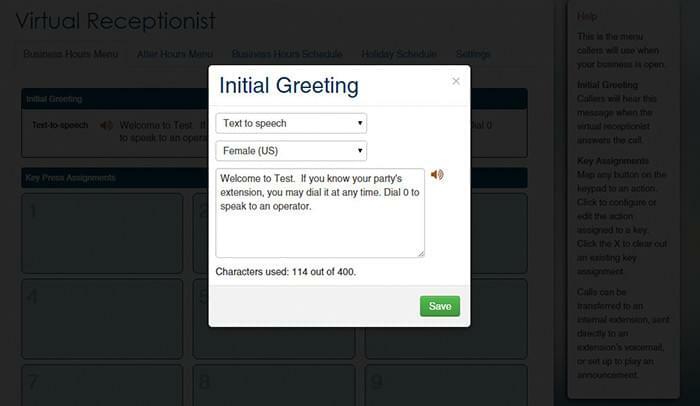 You can edit the text-to-speech to customize the greeting. You can also change the voice to Male from Female, or can switch it to have a British rather than American accent. Different Virtual Receptionist greetings can be applied to different business hours or holiday schedules. Another useful capability in Ooma Office for handling callers is call routing. Calls can be routed using key assignments. For example, you can set it so that when a caller presses “0” they get the operator; “1” a specific person, “2” a voice mail or announcements and so on. Individual extensions are also configurable. You get one extension and the operator by default, and any additional ones you add, cost extra. 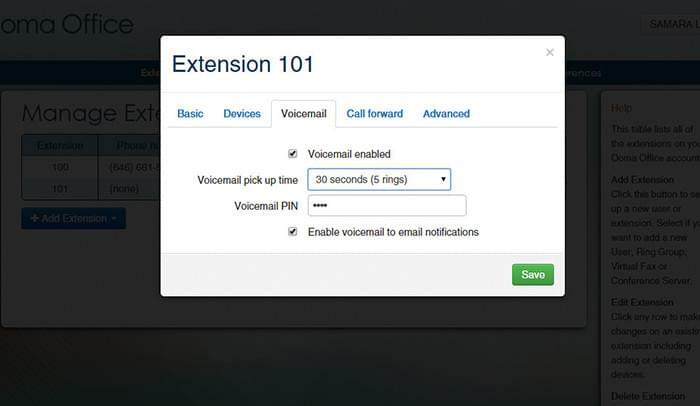 Extensions can be set to ring a specific amount of times before voicemail kicks in. 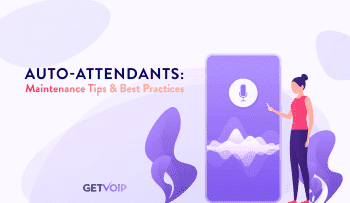 You can also configure VM notifications so that the owner of the extension receives an email whenever they are left a voicemail as well as an .mp3 file attachment of the message. Ooma Office supports up to five physical extensions and up to 20 virtual extensions.. 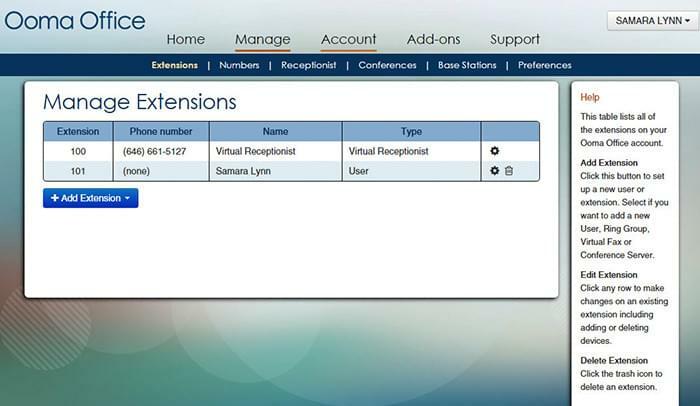 Virtual extensions are internal extension numbers can be forwarded to an external phone and set up with their own private mailboxes. Virtual extensions also cost an additional $9.99 per month, per extension. If you want to scale above support for five extensions, you will have to invest in Ooma’s $20 stack device, which provides an additional five physical extensions (more on this later). One Ooma Office base station can support up to three stack devices. 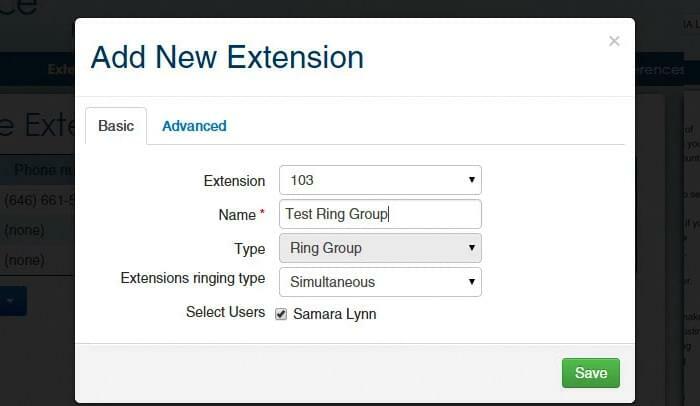 Ooma Office also supports up to 10 extensions assigned for conference calls. For every conference set up, that’s another $9.99 per month. Overall, the interface is intuitive for performing management tasks, which were formerly quite complicated to set up in PBX systems of days past. One of these tasks is setting up Ring Groups. To set up a Ring Group, just add a name for the group and select checkboxes next to the users you want to add to the group—it’s a very point and click type of management interface. I did notice some latency in the interface when saving configuration settings or moving through different screens–it took up to almost 15-20 seconds for some settings changes to apply. I was initially accessing the Ooma Office web-based interface via the Chrome browser. The speed of applying changes picked up a bit when I switched over to Internet Explorer 11. The Ooma Office Manager interface is supported on Internet Explorer 11 and higher; Firefox 3.0 and higher; Safari 7 and higher; and Chrome 30 and higher. If you encounter latency issues in the UI, it may just be a matter of switching browsers to resolve. After I configured two extensions; set up my virtual receptionist; and made some key assignments, I dialed into my new business phone system. The receptionist’s female voice is the default voice and very pleasant. I was able to access my test company’s directory by last name just as I set in key assignments, or I could just press a button to leave voice mail. Since you can remotely configure VM, I dialed into Ooma to set up my voicemail with my cellphone. It was very simple by following the instructions. I did notice as far as integrating Ooma with my cell phones, that the options are limited. For instance, since Ooma Office connects to my router, why can’t I opt to use my cell phone connected to my Wi-Fi network as my Ooma Phone? There is an Ooma Office mobile app for Android and iOS. I tested the Android version. You must first enable Ooma Office Mobile in the Office Manager interface for each extension that is to be used with the app. In the app, I was required to add my company’s number, my extension and Ooma Office password. I set calling mode to call out as my Ooma Office extension and to receive Ooma calls on my cell. There are also some additional configuration options: setting the ring time before a call goes to VM, enabling call forwarding, seeing call logs and accessing voicemail. I placed a Skype call to my Ooma number to ensure my cellphone rang. It did. However, I also noticed the app had performance issues. It froze my entire phone at one point and I also had trouble answering and ending calls without the screen freezing. My phone is running Lollipop, the latest version of Android which is supposed to be compatible. Clearly, the app (at least for Android), needs work. There is no other option for using your mobile phone with Ooma Office except if you want to forward calls to it. For inbound calls to ring both your Ooma phone in your office and cellphone, you have to add your cellphone as an external number and pay Ooma another $10 per month. That’s ludicrous, because now you are paying two fees for your cellphone. Ooma Office has additional capabilities including call transferring and 3-way calling. You can upload custom music for music on hold or for call transfer wait time. A strong point is the abundance of contextual help within the interface. Every setting has a sidebar on-screen with clearly-written information about each setting. The interface also has a link to Ooma’s support page which offers 24/7 live chat help, phone support and a searchable knowledge base. Live chat and phone support is not without some weirdness. 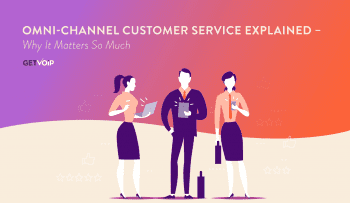 I went to Live Chat early in the morning, before business hours to ask about the possibility of connecting two Ooma Office base stations to the same network to double the amount of phone extensions. i was pleased that I had waited no more than five minutes before a response. While Live Chat was prompt in answering me, I was curiously told by the Ooma Live Chat agent that yes, while that was possible, I would need to call Ooma Office support. Um—wasn’t I on with support already via Live Chat? And if she could tell me that yes, I could use two Ooma Offices to double my extension capacity, why did I need to call in to support? Yet, call I did. And things got even weirder. As per the recorded instructions, I pressed “1” on my keypad for Ooma Office support. A person picked up and then told me after hearing my question, that he needed to transfer me to Ooma Office support. This Ooma Office support team is quite clandestine! Finally someone answered who could elaborate on my questions (and I didn’t have to wait but a minute or two for someone to get on the phone). The person told me. 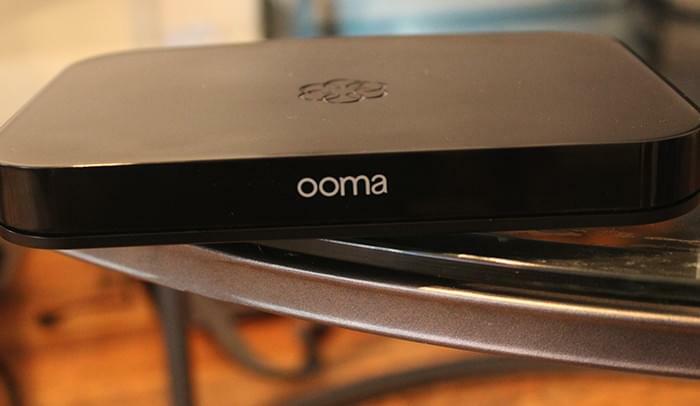 I would need to purchase a stack device for $20 which would add physical extensions to my Ooma Office setup. You can add three stack devices per Ooma Office base station, by the way. It’s sort of telling (in both a good and maybe a bad way), that Ooma Office ships with a return label. It’s definitely easy to return the device if you want. Just repackage and slap the label on the box. According to Ooma, the return must be made within 14 days of receiving the equipment and once they receive the device back, your monthly subscription is cancelled. Ooma Office is successful in that it makes business-class VoIP very accessible for small and micro businesses. Adding features as a business grows can become expensive, and some users made find the current feature set limiting. Also, Ooma has to get more with the times and add robust mobile support or make some changes to its mobile app.